Recent events brought to mind a photograph by W. Eugene Smith (1918-1978), one of the greatest photojournalists of all time. Forgetful of personal risk, Smith wedded “news” photographs to a powerful aesthetic sensibility, creating a body of unforgettable work. Smith was an idealist. During WWII, he aimed for nothing less than showing the horrors of war so vividly that people would recoil from the prospect in the future. As a Life Magazine photographer, he landed with marines during 13 Pacific island invasions, including the battles of Saipan, Guam, Iwo Jima, and Okinawa. I think as 2012 draws to a close, we all are in need of “sonnets to life and to the courage to go on living it.” Smith’s photograph is the one that I am thinking of at this time. 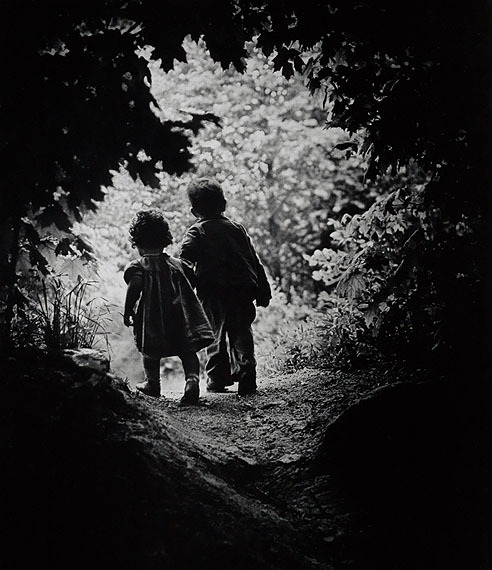 This entry was posted in Photography and tagged history, photography, The Walk to Paradise Garden, W. Eugene Smith. Bookmark the permalink. How lovely! I have a copy of this print as I’m sure many people do, but I had no knowledge of the story behind it. Thank you! Happy New Year! I first heard the story a long time ago, in a History of Photography class taught by a prof who really admired Smith’s work. I thought Paradise Garden had been used as a Life Magazine cover, but I guess not. There are some very nice copies of his work online. Where did you find a copy of The Walk to Paradise Gsrden? Great story to go with this wonderful photo. And thanks for the reminder of Family of Man. I have that book around here somewhere and haven’t looked at it in a long time. I should get it out. It’s very affirming. Thanks for another thoughtful post. I wish you and Mary a happy and prosperous new year. We also have the Family of Man book “around here somewhere.” It was one of those posts that started out in one direction and meandered to another that was better. Happy New Year to you and your family too! I did Goggle search and I found no place that listed the print for sale.